Las Palmas Gran Canaria Beach "Las Canteras"
Take a first look at our accomodation reviews of Canteras Beach Apartment rentals or reviews of Hotels in Las Palmas. Go along with us to a sightseeing tour to Vegueta Las Palmas, the nice old town, check flights: arrivals, airport transfers and departures at the Las Palmas Gran Canaria Airport or visit our Gran Canaria weather forecast to find out, if your Las Palmas tour will be accompanied by the warm & sunny canary climate. Read our Bars & Restaurants reviews, shopping tips, or enjoy our Gran Canaria pictures galleries and images of Las Palmas city. Where to go in Las Palmas and Grand Canary Island? Use a local bus "Guagua" or the Las Palmas Car hire at airport to discover Gran Canarias Beach resorts like Playa del Ingles, Amadores – Puerto Rico, the famous Maspalomas dunes or former Fishing-Villages like Mogan and Agaete – Puerto de Las Nieves. Plan Excursions to Tejeda in the inner mountains, book with us a surfcamp or improve your spanish at the Las Palmas language school. Our Las Palmas de Gran Canaria Online-Guide is in its broad & deep content unmatched because edited locally – directly in the heart of Las Palmas City and under permanent development. The official winner of the Carnaval 2011 poster-contest was now awarded and the City council released now the final dates for the nearly one month during carnival-festivities in Las Palmas 2011. The City of Las Palmas de Gran Canaria tries to set a new world record for the Guiness Book of Records: on 5th June at the northern Canteras Beach Las Palmas applies to reach the officially accreditet Guiness title "Largest Towel of the World". Discover the City of Las Palmas de Gran Canaria! 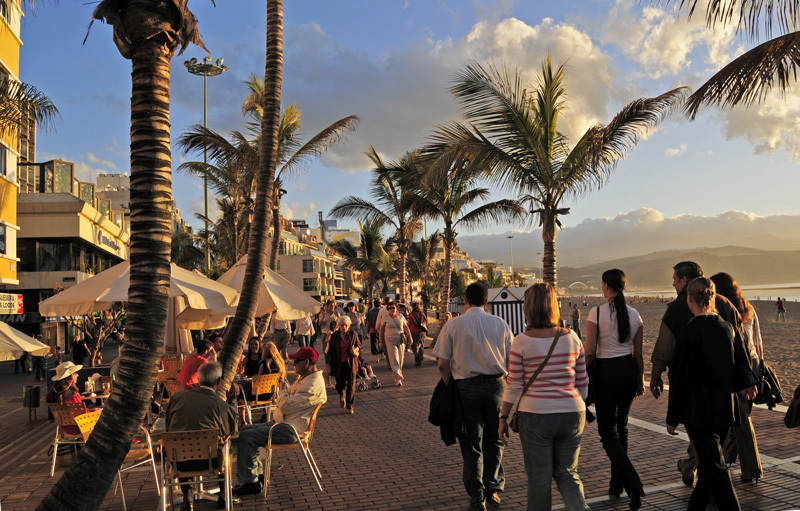 You will hardly find another city in Spain that offers to her citizens and visitors such a wide variety of different attractions: beautiful and clean Las Canteras Beach, a lively Old Town which is definitely worth a visit, enjoyable shopping and entertainment districts. Only one or two kilometres away you have the choice between sun beds and paragliders, a stroll through the Old Town "vegueta" and a dive to a reef. All of this, however, is not exotic luxury. You can reach Las Palmas de Gran Canaria very easily, fast and at low costs – still, it is far from being overcrowded by tourists. After arriving at Gando Airport Las Palmas (LPA), almost all tourists on the island turn south. This is why the tourists on the beautiful and well looked-after "Las Canteras beach" are always a modest minority. Las-Palmas-24.com does not only complement the typical travel guide in book-form, it offers much more than simply a good travelogue: interactive city maps and satellite maps give you an overview – accurate to the metre – where you can find viewpoints, sights and recommended restaurants. Additionally, we offer daily up-to-date reports, photos and news about all types of events, cultural events and other attractions in Spain’s most Southern metropolis. For very impatient people the Las Palmas-Webcams offer a first glance. Travelling information which is updated on a regular basis and tips from insiders for recommendable hotels, apartments, pensions, restaurants and bars. Everything is linked and thus makes for one of the most complete and most useful city guides about Gran Canaria’s capital. These topics are already online and they are upgraded every day: official and neutral hotel lists, a long index of apartments and pensions. Hundreds of pictures of city tours, viewpoints and sights (not just for museum enthusiasts). Insider tips about shopping or eating out without disappointments in the best of the many hundreds of restaurants. An enormous scope of information for surfing, bodyboard, where and how to dive on Gran Canaria: reports about diving schools and a map of interesting places for diving. Photo articles about the Womad Festival and the Carnaval 2007, as well as many other photo articles and interviews and reports. Comprehensive information on arrival, such as flights or ferries from and to Las Palmas, transportation with bus, taxi, hire-cars and bikes can all be found on our extensive information sites. The LasPalmas24.com-travel site will certainly never be “finished” as it is upgraded almost daily on location. 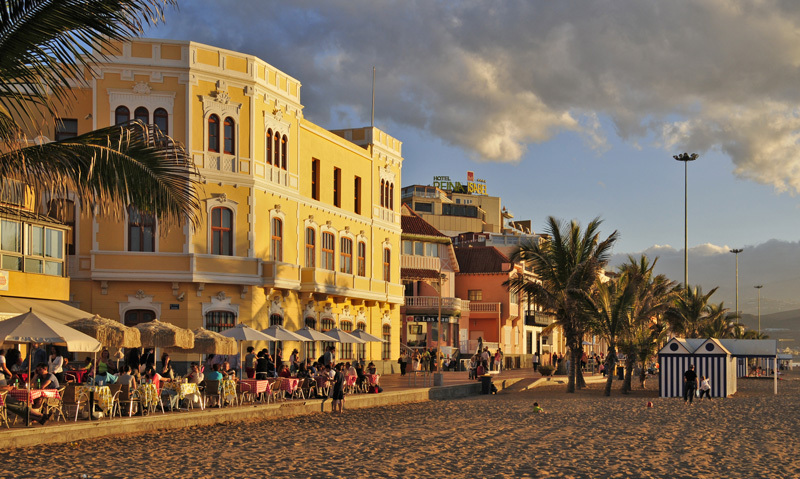 If you don’t find what you are looking for this time, just leave criticism or suggestions – we work on our travelogue each day and on your next visit you are sure to find brand-new and up-to-date news from Las Palmas! P.S. : don’t hesitate to let us know your personal tipps, criticism and any suggestions you might have: each and every additional experience for the Las Palmas holiday is welcome. Send us an e-mail or sign our guestbook! The Las Palmas Guide tries to offer you an alternative resource for your Travel- & Tour planning, serving you with neutral informations about accomodation, transfers and activities. Check also our local knowledge over Hotels, Apartments and sport activities like diving, surfcamps, language-courses. Our incoming services include Apartment bookings and reservation of nearly all other activities on Gran Canaria Island. Surfing-Spot La Cicer / Las Palmas: pictures beach boys surf city: "La Cicer"